Many astrologers write horoscopes, but few have devoted their lives to the calling. My horoscopes are available to Planet Waves Core Community and Backstage Pass holders. Written with care and precision, my astrology columns provide you with immediately relevant information that you will come to depend on, as have thousands of my readers for many years. They are designed to be comforting in times of stress, encouraging of your potential and to provide clear strategies for success and happiness. I offer timely information from reading the planets, as well as ideas for personal growth and self-therapy and a cohesive philosophy of life. My primary weekly and monthly interpretations are a centerpiece of our two membership packages. I blend advanced modern astrology, classical astrology, contemporary spirituality, ideas from a diversity of therapy models and a clear journalistic writing style. These readings work equally well for the Sun sign and rising sign. If you don’t know your rising sign we will look it up for you. My weekly and monthly horoscopes, published Monday mornings and Thursday evenings, are available to Backstage Pass holders and Core Community members. Planet Waves Weekly appears exclusively on the Planet Waves website. Planet Waves also publishes the Moonshine horoscope by Len Wallick. 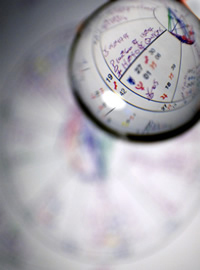 Introductory Members and visitors may read the Inner Space monthly horoscope. If you are curious about the history and development of the horoscope, you may read this article called Cosmic Confidential: My Life as a Horoscope Writer. I look forward to serving as your astrologer, helping you go through your changes and most of all, thrive in our positively bold moment of history. PS — You may read some sample horoscope readings here.